The U.S. Energy Information Administration announced earlier today that global crude oil production is expected to see a brief fall in the third quarter of 2017, which is forecast to lead to a slight expansion throughout 2018, according to a recent study conducted by the Association. According to the EIA, a slight tightening in production during quarter three of this year is forecast to lead to 32.5 million barrels per day by the end of the first quarter of 2018. The EIA reports that the price of oil over the course of quarter three may lead to possible increases in price over the next few months of this year. Due to projections of lower oil productions, the EIA reports that the responsiveness of the United States to global oil production may ultimately mean a greater supply in the country for 2018. The EIA reports that increases in United States-based production may be attributed to drilling activity, particularly the activity of drilling shale basins in Texas. For drivers, this may mean more oil hauling opportunities in the future, or other heavy-duty market driving positions to become available over the course of the next few months. 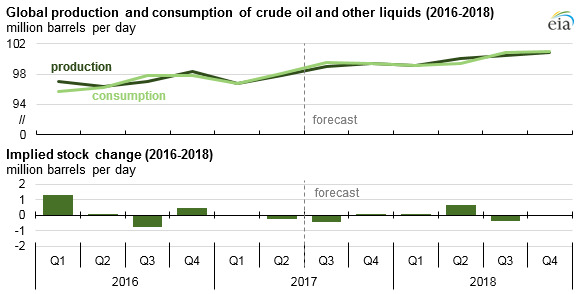 Additionally, the EIA reports that the largest global increase for crude oil will occur in quarter two of 2018, due to OPEC and Brazilian-driven production are on the rise. This projected global production may see oil prices in the United States go down as early as the end of 2017. The EIA expects United States oil production to continue towards 9.3 barrels per day in 2017 and nearly 10.0 million barrels per day in 2018.